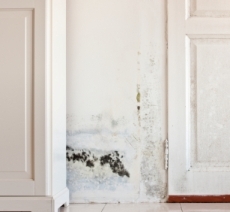 Mold on walls can be hard to remove, depending on the type of wall. For mold removal walls that are concrete or tiled, they can often just be scrubbed. Walls that are sheetrock or drywall must often be rebuilt. Wall studs must often be cleaned and then encapsulated to seal in all traces of mold. It’s a complex process, to be sure. If only a little mold is left behind, it can spread and take over an entire structure in time. It’s very important to do a very thorough job removing mold from your walls (and anywhere else in your house). The recommended procedure for removing mold from walls starts with isolating the affected room from the rest of the house because mold spores can easily become airborne and spread. This is usually accomplished by using duct tape to tape large plastic sheets over doorways, vents, hi-hats, etc. Contaminated sections of drywall or sheetrock will need to be replaced as you cannot really repair it or fully clean it. You can scrub mold on walls that are made from concrete; they do not have to be torn down and replaced. If old drywall or other building materials must be removed and replaced, dampen them first to prevent mold spores from becoming airborne, and then carry them through the house in large plastic bags to prevent other areas from becoming contaminated with mold. If you have mold on walls, you should check for mold inside walls, like along wall studs and in insulation. Mold in walls is a bit more challenging to remove, but it’s important to remove it for your health and the health of your family. Moldy wall studs need to be cleaned and encapsulated, and moldy insulation must be replaced. (Some professionals will sand down wall studs to remove all the mold, but homeowners should not attempt this). Be sure to take adequate safety precautions when removing mold. During mold removal walls can send lots of mold spores flying into the air, which can cause health problems in some people. Using a negative air machine is also recommended to help contain mold spores that get into the air. You should wear an N-95 respirator mask, long rubber gloves, goggles, a hair cover and slip-op shoe covers, so that none of the mold spores that become airborne will settle on your face, hands, hair or clothing. You especially don’t want to breathe them in. Don’t let young children or others not trained and not fully capable of understanding the risks involved assist in the process of cleaning up mold on walls. During mold removal walls can throw a lot of mold spores into the air and breathing can be hazardous for people in the area, especially the young, the old and those with special respiratory problems. Don’t be tempted to skimp on the safety gear; respiratory infections, asthma attacks and the like can be quite serious. Of course you can call in a professional to handle the job for you, but that’s going to be costly. You might want to have a professional handle any mold removal walls, though, since that is a big job. If you have severe asthma or other serious respiratory problems, it would be best not to handle the job yourself. If you have family members with serious respiratory problems, arrange for them to stay elsewhere for a day or two while you address the home’s mold problem. The Environmental Protection Agency recommends calling a professional if mold covers an area of wall greater than ten square feet. Call a professional if you suspect mold inside your walls, unless you are experienced at replacing insulation and drywall. 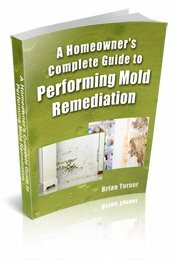 Call a professional if there is mold on wooden studs inside your walls; techniques for treating mold in these instances may include sanding and encapsulation, but a professional should be consulted before doing things these. Call a professional if you suspect mold inside your heating and air conditioning ducts. If you have mold-related health problems or any type of respiratory disorder, speak to your physician before attempting to clean up mold on your own, or just play it safe and call a professional. You can schedule a free consultation with a professional to discuss your options for mold removal. You can get free helpful tips and advice even if you end up opting to handle the job yourself. Just follow this link to find professionals offering free consultations in your city or town.